Cimarron Correctional Facility is located in Cushing Oklahoma. 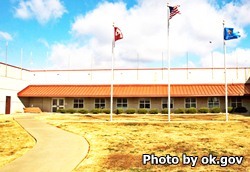 The facility is privately run by Corrections Corporation of America (CCA) through a contract with the Oklahoma Department of Correction. The capacity of Cimarron Correctional Facility is 1,720 adult male inmates. Offenders may be selected to work jobs within the prison performing supportive roles in maintenance, landscaping, and in food preparation and serving. Cimarron Correctional Facility offers inmates adult basic education courses, the ability to earn a GED, and courses in horticulture, commercial cleaning, and computers. Substance abuse treatment programs, including a long term therapeutic community program that last 12 months is available for inmates who suffer from alcohol and drug addiction. Additional self help groups like Narcotics and Alcoholics Anonymous, family counseling, and the 'Thinking for a Change' program is also available to offenders.